Rayman Legends is a fun and well-designed 2D platformer that's great for multiple players seeking casual cooperative gameplay. Rayman Legends is a 2D platformer from Ubisoft that has the option for cooperative gameplay. It comes from a long series of Rayman games but brings an upgrade in graphics and gameplay, creating a game that not only longtime fans will be happy with, but first-time players, too. We played this game on the PS4 to further explore the game’s plot, gameplay, graphics, and sound design―and we were not disappointed. Setup for Rayman Legends is what you would expect. You’ll open up the PlayStation 4 case (or if you buy the game electronically through your PS4, you’ll begin the download process after purchase), pop in the disk, and you’ll be ready to play. Be aware, though, that certain features of the game will not be accessible if your PS4 is not connected to the internet. Specifically, you won’t be able to access the Challenges mode, where you can play weekly challenges against other Rayman Legends players. Plot: Not much of one, but who cares? The Rayman games have been around for years, dating back to the original, which was published in 1995. Since then, the story, characters, art, and gameplay have come a long way. In this game, you’ll choose a level―each of which is uniquely themed and has multiple maps for you to work your way through. 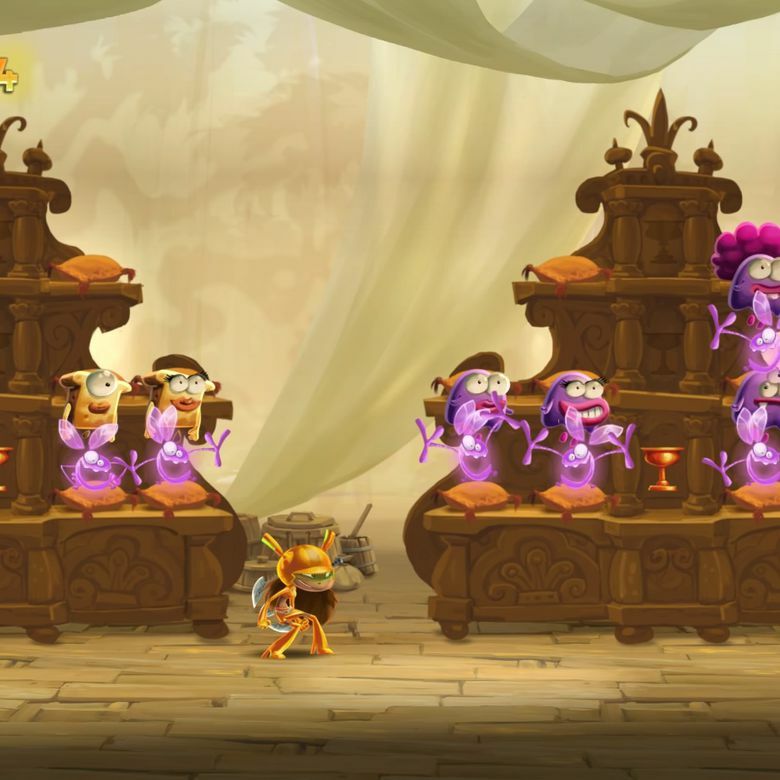 Rayman Legends isn’t focused on plot; it’s more interested in providing outstanding gameplay. Once you’ve loaded into a map, you’ll come face to face with the hero’s enemy, the Magician. He’s determined to capture all the royal Teensies in the game (a small blue creature you must find and set free in each map). You’ll chase after him, jumping from platform to platform, slaying the occasional enemy as you go. That's about it when it comes to the plot of Rayman Legends. Sometimes the Magician will give you a specific enemy to dodge, like a giant red dragon, and at the end of certain maps, you’ll get an opportunity to catch him. But really, Rayman Legends isn’t focused on plot; it’s more interested in providing outstanding gameplay. Rayman Legends is a 2D platformer, reminiscent of such games as Super Mario Bros. and Donkey Kong, but with its own history and development. Be prepared to do lots of jumping, the occasional timed run, and even a few boss fights. Thankfully, Rayman Legend is fairly forgiving when it comes to platformers. The controls are smooth, jumps are generally easy to land, and a glide feature can save you when you accidentally jump too late. Plus, a nice distribution of save points make it easy to try again if you do die. While each level does get progressively harder as you go (indicated by the number of small skulls under the map entrance), most are achievable by the average player. There’s also the added bonus that if you are having trouble, you can force your friend to join you. When one of you dies, you’ll just turn into a bubble and your friend can free you with an attack. This game is fairly forgiving: The controls are smooth, jumps are generally easy to land, and a glide feature can save you when you accidentally jump too late. Teaming up for the harder levels not only makes the game a little easier, but it also makes the game more fun. You can co-op with up to four people at a time on the PS4, which combined with the casual and fun nature of the game makes it a great recommendation for best friends or for a couple who enjoys gaming together. In the game, there are six levels, each with roughly ten maps. You’ll have to work your way through the first level to unlock the second, and so forth. Unlocks are achieved when you reach a certain number of Teensies saved―which the Magician has locked up and hidden in various places throughout each map. There is also a type of in-game currency called "Lums" that you collect as you run through each map (they look like pink or gold fireflies). When you’ve reached a certain number of Lums, you’ll be able to unlock new heroes, which there is no shortage of. The levels grow gradually more complex as you progress, and while we admit that most levels weren’t too difficult, a few at the end of the game will be challenging for even well-practiced players. Beyond the basic six levels and maps, the game’s other features are also great. There is a Soccer mode, where you play on a small 2D field versus your friend; scratchers that are rewarded after certain levels, where you use the PS4’s touchpad to reveal a random reward; and a creatures page where you can view all the weird Rayman creatures you’ve collected from scratchers. Our favorite feature is the ability to unlock levels from Rayman Origins, the game that came before Rayman Legends. It’s like you’re getting two games for the price of one. The Challenges mode, which we mentioned earlier, is where you can attempt weekly challenges, earn rewards, and get your username on the leaderboards. The last feature―our favorite―is the ability to unlock levels from Rayman Origins, the game that came before Rayman Legends. It’s like you’re getting two games for the price of one. Rayman Legends has a unique look, which is represented fairly well by its bright and eye-catching cover. It doesn’t attempt to be realistic but embraces cartoon-like graphics, with goofy characters and villains mildly reminiscent of real-life creatures. In the level titled Toad Story, you’ll come across screaming toad monsters carrying swords and shields. In the Fiesta De Los Muertos level, be prepared to smash brightly colored mariachi skeletons. No matter which level, though, the art style is consistent, and while not traditionally beautiful, it’s enjoyable and fun―a perfect fit for the game. Generally speaking, the sound and music in Rayman Legends is well designed and fits with the feel of the rest of the game. But there is one thing worth mentioning when it comes to the sound and music of the game―and in our opinion, it’s the coolest thing about Rayman Legends. At the end of each level, a special map is unlocked. This map is themed to fit with the level’s design, and each features a specific song. You’ll load in, be told to prepare yourself to run at full speed while jumping and smashing enemies, and then, as you set off, the first notes of the song begin. The beauty of these maps is how well the gameplay is designed to match the beats of the song, from how each jump will strike with the strum of a guitar, or how the smash of a drum will be timed with the slaying of an enemy. The levels might take you a few tries to finish, as they’re timed and require precision, but they’re fun enough you won’t mind doing them again. Rayman Legends can be purchased for most systems at around $20. Sometimes PlayStation will put the item on sale, and you might even be able to get a copy for less than $15. The Nintendo Switch version of the game is more expensive, so beware. However, no matter which system you’d prefer to play on, the value is worth it. The game has a lot of extra content and is more than fun enough to warrant the cost. Sometimes PlayStation will put the item on sale, and you might even be able to get a copy for less than $15. If you enjoy the Rayman characters and style, there are a lot more Rayman games to explore. We probably wouldn’t suggest getting Rayman Origins since much of that gameplay is included in Rayman Legends, but one could look at Rayman Adventures. If you’re looking for other fun co-op platformers, we would suggest any of the Trine games, which focus on character-swapping and puzzles more than Rayman Legends, or Nintendo’s New Super Mario Bros. U Deluxe for the classic Mario experience. Get this game. It’s fun, creative, and different. Between the co-op option, the extra levels, the ability to replay Rayman Origins, and all the other things you can unlock from special heroes to scratchers, this game has a lot to offer for gamers of all ages. Product Dimensions 5.3 x 0.6 x 6.7 in.